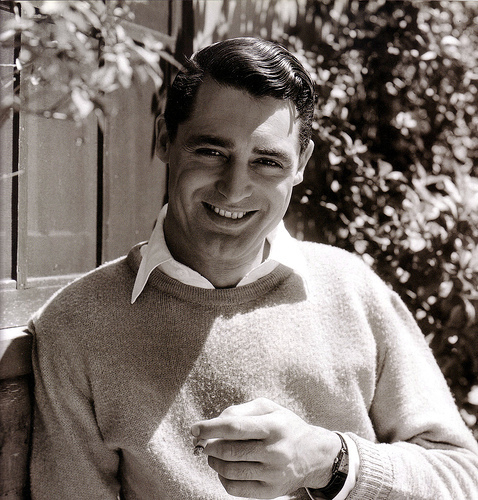 If one man epitomised cinema’s idea of sophistication, it was surely Cary Grant; it could be said Grant invented metrosexuality before modern day stars like George Clooney were even the proverbial ‘glint’ in their parent’s eyes. He was the onscreen personification of the man-about-town – successful (as the high-flying advertising executive Roger O Thornhill in Hitchcock’s North By Northwest (1959)), seductive (as the elusive John Robie who romances Grace Kelly in another Hitchcock classic, To Catch A Thief (1955)) and suave in, to be honest, every film he ever appeared, whether comedy, thriller, romance or even musical. However, when studied, the private life of the man who was married five times, yet indulged in a twelve year off and on ‘friendship’ with matinée idol Randolph Scott, seemed at odds with his on screen image. Born Archibald Alexander Leach on January 18th, 1904, in Bristol, England, Grant, (as he later renamed himself) was an only child. Unhappy at home (his mother was clinically depressed, and his father disowned him when he remarried after placing Grant’s mother in a mental institution), he joined the ‘Bob Pender Stage Troupe with which he toured America. Staying in the Sates after the tour had finished, the young Archibald eventually made his way to California where his good looks, sharp wit and a new name found him stardom, wealth and a permanent place in the higher echelons of Hollywood society. But his private life never quite mirrored his successful, easy going on-screen persona. A glittering array of wives included French actress, psychotherapist and writer Betsy Drake (godmother of Roald Dahl and Patricia Neal’s daughter Tessa Dahl), and Woolworth’s heiress Barbara Hutton, whose marriage to Grant was monikered ‘Cash & Gary’ in the popular press; Grant being a wealthy man by the time of his marriage to Hutton never asked for or received any money from a woman whom it appears he genuinely loved and cared about. The reason behind his lack of success in marriage could lie with the fact that his inclinations, if honest, lay elsewhere. In a day when homosexuality was frowned upon and ‘coming out’ would have meant career suicide in Hollywood (which it still can), Grant’s ‘friendship’ with the attractive and athletic Randolph Scott was painted by the studio publicity machines as nothing more than two bachelor boys who happened to share a beach house in between their respective wives and girlfriends. The underlying sexual chemistry between the two men photographed being ‘cosy’ whilst cooking dinner at their home or accompanying each other to premiers and parties, may be obvious to today’s media savvy audience, but in the 1930’s and 40’s when Grant and Scott’s relationship was at its height, the fans only saw what they (or the studios) wanted them to. Perhaps if Grant had been allowed to follow his heart his troubled private life may have followed a calmer course. Whatever failures he encountered privately, Grant’s life on screen appeared the complete opposite. In a career spanning 34 years he appeared in countless box-office hits, many of which are today considered classics. Never loosing his cool he always managed to extricate himself from whatever precarious predicament he found himself in without a trace of a cold sweat or a hair out of place, whether in comedies like Frank Capra’s Arsenic and Old Lace (1944), or the frequent perilous situations Hitchcock placed him in the four films they made together. This ability, along with a Savile Row appearance, also attracted a cavalcade of screen beauties. Actresses including Audrey Hepburn, Deborah Kerr and Doris Day literally fell over themselves to star alongside Grant, whose name above the title was guaranteed box office gold. Despite the successes, two roles eluded Grant – those of James Bond and Oscar winner. A strong contender for the first screen Bond, Ian Fleming apparently had Grant in mind when he created the iconic British spy, Grant passed on the role as he felt he didn’t want to be tied to a character – a decision he may have regretted afterwards. As for the Oscar, though nominated twice, he was constantly overlooked for the award despite numerous worthy performances. Appearances as the perfect foil to Katherine Hepburn’s batty socialite in the sublime comedy of errors Bringing Up Baby (1938), or the icy cool secret agent who rescues Ingrid Bergman in Hitchcock’s espionage masterpiece Notorious (1946) would more than have qualified for academy recognition. It wasn’t until 1970 however, that he was given an honorary Oscar for Lifetime Achievement, often considered as the film world’s equivalent of a consolation prize. Grant, ever the gentleman, would of course never have said this and was always nothing less than appreciative in public. An interviewer once joked to Grant that “everyone would like to be Cary Grant” to which he replied with characteristic wit “so would I!” Which proves that perhaps he was just like the rest of us after all.